The global pharmerging market is experiencing a significant rise, especially in the emerging economies across the world. The rising prevalence of non-communicable diseases, aging population, increasing life expectancy, escalating income, surging government expenditure on health care, free trade agreement, and the constant research and development are some of the key factors behind the growth of this market. With the increasing incidence rate of various diseases, the demand for highly innovative and better outcome products is also increasing, which is likely to result in a substantial growth of this market in the future. The continual innovation and advancements in the drugs for the treatment of a host of diseases are also anticipated to drive this market over the next few years. The global market for pharmerging, which stood at US$552.8 mn in 2015, is expected to rise at a CAGR of 11.30% between 2016 and 2024 and reach a value of US$1.40 bn by the end of 2024. On the basis of type of product, pharmaceuticals and healthcare are the two main segments of the global market for pharmerging. The pharmaceuticals segment dominated the overall market in 2016 with a share of 65.2%. The scenario is expected to continue like this over the next few years, thanks to the significant rise in the demand for both, the branded as well as generic drugs. Apart from this, the increasing number of innovative therapies for the treatment of various diseases at affordable price is also projected to boost this segment in the years to come. On the other hand, the healthcare segment is likely to be driven by the growing emphasis on medical devices used in the diagnosis and treatment of a number of diseases. Based on the indication, the worldwide market for pharmerging has been classified into lifestyle diseases, cancers and autoimmune diseases, and infectious diseases. Among these, lifestyle-borne and cancer and autoimmune diseases are projected to offer lucrative opportunities for the growth of this market with attractiveness index over the forthcoming years. In terms of the geography, the global pharmerging market reports its presence across Latin America, the Middle East and Africa, Asia Pacific, North America, and Europe. With a share of 53%, Asia Pacific led this market in 2016. Researchers expect this regional market to remain on the top, thanks to rapid urbanization, increasing patent expiration, and the surge in the investments for medical research. China has emerged as the key domestic market for pharmerging in Asia Pacific. Among other regional markets for pharmerging, Europe and Latin America are likely to witness healthy growth in the near future. Technological advancements, extensive research and development practices, and the increasing awareness regarding the treatment and the management of healthcare facilities are likely to propel the Latin America market. The Europe market is predicted to be drive by the large population size, growing disease prevalence, and the increasing health expenditure in the region. Huadong Medicine Co. Ltd., Sun Pharmaceutical Industries Ltd., Tata Consultancy Services Ltd., LUPIN, GlaxoSmithKline Plc., AstraZeneca, Teva Pharmaceutical Industries Ltd., Johnson & Johnson, Novartis AG, Merck & Co. Inc. F. Hoffmann-La Roche Ltd., Koninklijke Philips N.V., and Abbott Laboratories are the leading players in the global pharmerging market. This report on pharmerging market studies the current as well as future prospects of the market globally. The stakeholders of this report include companies and intermediaries engaged in the manufacture and commercialization of various pharmaceutical products as well as new entrants planning to enter this market. This report comprises an elaborate executive summary along with a market snapshot providing overall information of various segments and sub-segments considered within the scope of the study. This section also provides the overall information and data analysis of the global pharmerging market with respect to the leading market segments based on major products, applications and geographies. The market overview section of the report explores the market dynamics such as drivers, restraints, and opportunities that currently have a strong impact on the global pharmerging market and could influence the market in the near future. Market attractiveness analysis has been provided in all the sections of the report in order to explain the intensity of competition in the market across different products/materials/technologies/end-users/geographies. The competitive scenario among different market players is evaluated through market share analysis in the competition landscape section of the report. The section also includes competition matrix that analyzes the competition among some of the top global players operating in the market. All these factors would help market players to take strategic decisions in order to strengthen their positions and expand their shares in the global market. The global pharmerging market is divided into: by product, by economic growth levels, by distribution channel and by geography. Product type segment of pharmerging market was divided into Pharmaceuticals (Branded Prescription Drugs, Generic Drugs (Branded Generics, Unbranded Generics), and OTC Drugs) and Healthcare (Medical Devices, and Diagnostic Instruments, Others (IT and record management)). On the basis of Economic Growth Levels the market was divided as - Tier – 1, Tier – 2 and Tier – 3). On the basis of distribution channel the pharmerging market is divided as hospitals, clinics, retail pharmacies, e-commerce, and drug stores. 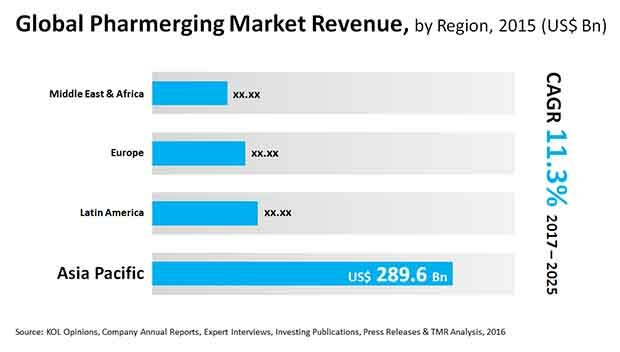 Geographically, the pharmerging market has been segmented into five regions: North America, Europe, Asia Pacific, Europe, Middle East & Africa (MEA), and Latin America. Each regional market for pharmerging market has been further categorized into major product, applications, material, and end-user segments considered within the scope of the study. Key country (U.S., Canada, Japan, Germany, France, U.K., Australia, Canada, China, Brazil, Mexico, India, etc.) market revenues have also been provided in different regional sections within the report. Market revenue in terms of US$ Mn and volume in terms of units for the period from 2014 to 2025 along with CAGR % from 2016 to 2025 are provided for all the regions and nations considering 2016 as the base year. The report profiles key manufacturers in the pharmerging market based on various attributes such as company details, SWOT analysis, strategic overview, financials, and business overview. Major players profiled in this report include Abbott Laboratories, Koninklijke Philips N.V., F. Hoffmann-La Roche Ltd., Merck & Co., Inc., Novartis AG, Johnson & Johnson, Teva Pharmaceutical Industries Ltd., AstraZeneca, GlaxoSmithKline plc., LUPIN, Tata Consultancy Services Limited, Sun Pharmaceutical Industries Ltd., Huadong Medicine Co., Ltd., etc.